Our recent report, Lost in Place, closely tracks the growth of concentrated poverty in the nation’s cities; this is particularly important because of the widespread evidence of the permanent damage high-poverty neighborhoods do to children of poor families. Two new studies shed additional light on the importance of economic and racial integration to the life chances of poor students and children of color. Quillian uses data from the Panel Study of Income Dynamics, a federal survey program that gathers longitudinal data on a representative group of Americans over several decades. Quillian shows that increases in segregation at the metropolitan level are associated with lower rates of high school completion for poor and black students. Poor and black students that live in more segregated metropolitan areas are less likely to graduate from high school after controlling for other observable factors that influence individual success, such as the level of their parents’ education. Significantly, higher rates of segregation do not appear to have any statistically significant effects on the high school completion rates of whites or the non-poor. Taken together, these findings suggest that increasing racial and economic integration improves the educational outcomes for black and poor students without any negative effect on the educational outcomes of white and non-poor students. This is important. If increased economic integration does not affect educational prospects for higher-income students, then the myth that having more integrated neighborhoods will “drag down” the potential success for the current residents is just that: a false myth. The implication of this research for housing policy is particularly salient. In another article, due for publication in a forthcoming issue of the Annals of the American Academy of Political and Social Science, Sean Reardon, Lindsay Fox, and Joseph Townsend look at the trends in income segregation. Using data from the American Community Survey, they look at the trends behind the growing overall levels of income segregation in most metropolitan areas. Their analysis finds that aggregate household income segregation has increased mostly because of the increasing isolation of the highest income households from low- and moderate-income households. Higher-income households are more likely to live in neighborhoods with other high-income households than was true two three decades ago. The authors also estimate changes in income segregation for each of the 50 largest metropolitan areas in the nation. They point out wide variations across the country. This plots household income against neighborhood income. 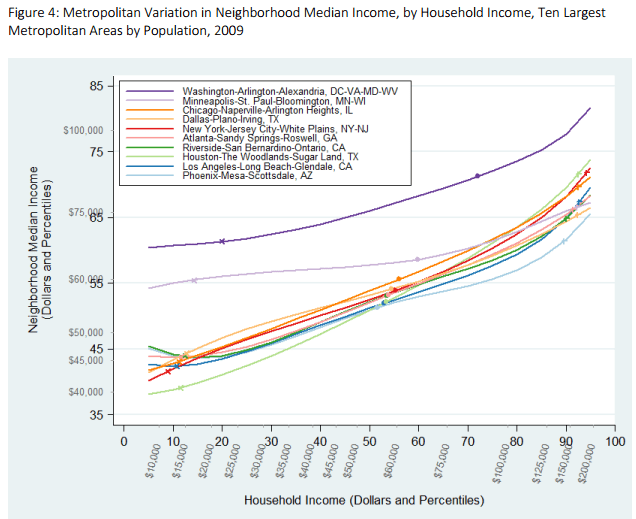 Most metros are similar, with the typical low-income family living in a neighborhood with a median income of $45K. Washington and Minneapolis have higher average incomes and are more economically integrated than other large metropolitan areas. Families in the lowest 25th percentile in these cities live in neighborhoods with median incomes of $60,000 (Minneapolis) and $70,000 (Washington). In the typical large metro area, you have to have an income of $75,000 (or more) to have such well-to-do neighbors. While the growing gap between rich and poor is capturing greater policy attention, these two studies remind us that the spatial patterns of integration within metropolitan areas have a big impact on the quality of life and life prospects, especially of low-income households. It also indicates that how we build and inhabit our cities influences educational attainment and economic success, have an important role in ameliorating the effects of income inequality, which can have long-lasting impacts on city-wide educational attainment and economic success. A hat tip to City Observatory’s friend Bridget Marquis for flagging these articles.